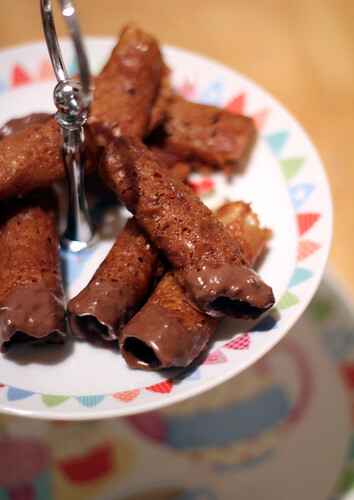 Brandy Snaps | Abandon Spoon! For Christmas my parents bought me the Great British Bake off recipe book, which I love as not only do I love that programme but I find the recipes really easy to follow, and although adventourous, fairly acheivable. This is my first recipe from the book, there shall be more to follow, in particular I am planning to try some of the technical bakes. 1. Pre-heat the oven to 180C/ 350F/ Gas 4. 2. Put the butter, sugar and syrup into a small heavy based pan. Heat gently until the butter has melted and the sugar has dissolved, stirring occasionally. 3. Remove from the heat and leave the mixture to cool for 2 to 3 minutes. Sift the flour and ginger into the pan, add the lemon juice and stir well. 4. Make 4 biscuits at a time on each baking sheet. For each biscuit, drop a rounded teaspoonful of mixture onto the sheet to make a neat round. Space the biscuits about 10cm apart. 5. 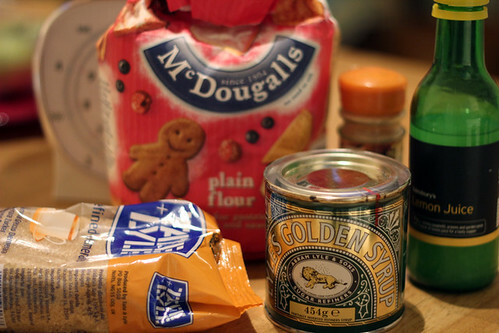 Bake for 10 to 15minutes or until the mixture has spread out to make a thin biscuit. 6. Remove from the oven and leave for a minute or so to firm up slightly. 7. Quickly roll the warm biscuit, lacy side out, around the handle of an oiled wooden spoon and press the join lightly to seal. 8. 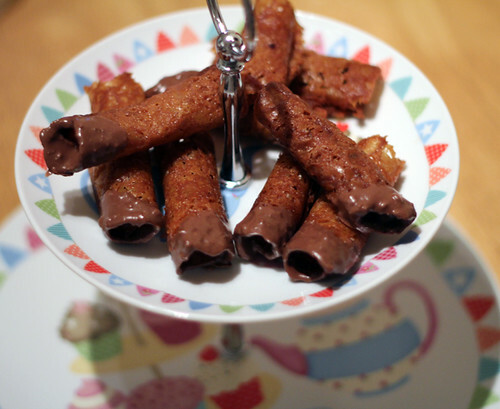 Slide the brandy snap off the spoon and onto a wire rack. Repeat until the mixture is used up. 9. 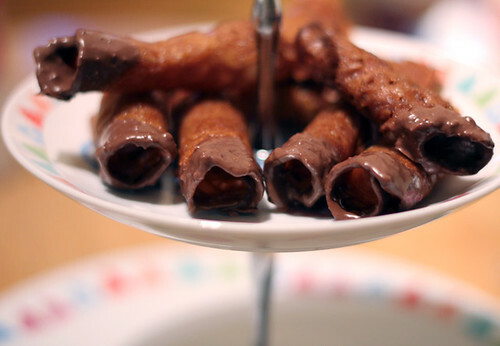 To decorate dip the ends of the brandy snaps into melted chocolate and leave to cool.